Itching, and the scratching, biting, and licking that goes with it, is one of the most common health problems in dogs and cats. 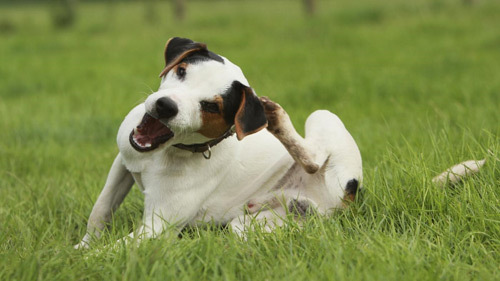 Frequent head-shaking, scratching, rubbing, chewing, or licking some area of skin (including ears) means there’s a problem with itching, technically called “pruritis.” Left untreated, itchy skin can be damaged by the pet’s scratching, rubbing, or licking, which may lead to hot spots on your dog (areas of oozing, dry or inflamed skin), as well as secondary infections. Finding out what is causing the itch, and resolving that cause, is essential to your pet’s quality of life. In very general terms, itchy-skin problems in pets fall into just a few main categories: poor nutrition, infections, parasites, and allergies are the major players; but endocrine diseases, primary skin disorders, neoplasia (cancer), autoimmune, pyschogenic (mental-neurological) causes, and drug reactions may also occur. Sometimes more than one factor may be contributing to the problem. This doesn’t include food allergies; but diets containing lower-quality nutrients are at the root of many an itchy pet. We know that good nutrition is the foundation of health, and the corollary is also true: cheap ingredients (such as corn and by-products) make for expensive vet bills. Unfortunately, even vets tend to be poorly educated on nutrition, and often recommend grocery store or “prescription”-type diets. Be sure to read this article, “What You Need to Know About Your Pet’s Food“, become a label-reader, and choose only good-quality natural foods for your cat or dog. Ideally, you should feed your dog the best organic natural dog food you can find. Also consider supplements, such as Omega-3 fatty acids, probiotics, and digestive enzymes, that will enhance your pet’s digestive and immune systems, and help avoid nutritional deficiencies that can cause so much misery. Skin infection (pyoderma) is surprisingly common in pets. The major infectious culprits are ringworm (not actually a worm, but a fungus that is highly contagious to other pets as well as humans), Malassezia (yeast), and bacteria. Ringworm is especially common in kittens and cats, while yeast and bacterial infections are more typical in dogs. The ears are lined with skin, so itchy ears in both dogs and cats are an extension of the same types of infections. Your veterinarian will need to make the correct diagnosis in order to properly treat the infection. However, one thing that vets don’t talk about much is why infection occurs. In holistic terms, infections are always secondary; the skin is unhealthy for some reason (often nutrition-related), and then invaders like bacteria, yeast, and fungus can get a foothold. Keeping the skin healthy via good nutrition (with wholesome meat proteins and plenty of essential fatty acids) is the best prevention. Please see our article, “Chronic Ear Infections,” for more details. Minor skin infections and hot spots may respond well to natural topical products offer by Only Natural Pet. These nasty bugs deserve a special place in the itch-causing chronicles. Bites from fleas are itchy all by themselves, but many pets develop a specific allergy to flea bites. This is most commonly seen as hair loss or rash at the base of the spine and tail, not to mention that the dog or cat will constantly be chewing at the area. Flea allergy dermatitis (FAD) is an intensely itchy allergic reaction to flea saliva that can be triggered by a single flea bite! You may never see a flea or flea dirt on your pet (though daily flea-combing is never a bad idea! ), and many people are quite confused as to how their flea-less pet can have such a severe reaction. If you live in an area where fleas are present (which includes most of the U.S. at least part of the year), always keep in mind that just one flea can cause intense itching for your pet that can last for weeks. There are prescription veterinary flea-prevention products available, but natural flea & tick control products are safer, and definitely worth a try before resorting to toxic pesticides. For more information, please read our article, “The Natural Approach to Flea Control.” Only Natural Pet also offers aids for flea & insect bites. Just like they often do in humans, mosquito bites can cause severe itching in sensitive pets, and in many areas of the country, can transmit heartworms, Lyme, and other diseases, so keep a natural insect repellent handy during bug season to help your pet stay bite-free. Lice are an uncommon cause of itching in pets. Fortunately they are highly species-specific; a dog cannot get cat lice, and vice versa. Lice are visible to the naked eye, but don’t jump like fleas. Good hygiene, grooming, and clean bedding are usually enough to prevent lice infestations. Ticks and mites are not insects, but members of the 8-legged arachnid family (along with spiders and scorpions). Ticks, while not usually itchy, can carry many diseases, and are well worth avoiding. Many flea repellents are also effective against ticks. There are half a dozen species of mites that can infest pets, from the highly contagious and severely itchy scabies (sarcoptic mange) to the mild-mannered demodex that inhabits normal skin, but in immune-compromised animals can cause itching and hair loss over the entire body. Mites are diagnosed through skin scrapings taken by your vet, although a negative sample may not guarantee there are no mites. Scabies in particular hides deep in the skin and is notoriously hard to find. If more than one animal in your home is itchy (including human animals), it may be smart to treat everyone for mites. Many animals are allergic to the same things that cause human allergies (dust, grasses, pollen, etc.). While humans’ allergies tend to affect the upper respiratory system with sneezing and watery discharges, dogs’ and cats’ responses are more likely to involve dermatitis, or skin inflammation. While this is a major cause of pets’ itching, these allergies are tough to diagnose, and other causes usually need to be ruled out first. Blood and skin tests can sometimes be helpful for dogs; less so for cats. Like humans, pets can also be allergic to chemical irritants like pesticide residue and household cleaning products. Allergies can be difficult to control, and almost impossible to eliminate. However, hypoallergenic diets, allergy support products and essential fatty acid supplements can be helpful. Food allergies are not quite as common as most people think, and they are actually more common in cats than dogs. Fortunately, food allergies can be resolved with diligent detective work, eliminating all common allergens from the diet (beef, chicken, eggs, corn, wheat, soy, and milk), then reintroducing one at a time to see which ones cause an allergic reaction. Strict avoidance of irritants can resolve most cases of pure food allergy. Grain-free and novel protein foods as well as raw food diets can do much to alleviate food-based allergies for many animal companions. Our articles, “All About Raw Food,” “Is Grain-Free Food Right for Your Companion?” and “The Role of Protein in Good Nutrition,” provide further details on this important topic. Some breeds and lines of cats and dogs are more prone to sensitive skin, or are more likely to develop allergic itching due to skin folds and ear shapes. Siamese and Persian cats often have immune system issues; and many breeds of dogs are more prone to allergies that cause itching skin. Dogs with many skin folds, especially around the muzzle (Shar Peis, Boxers, Bulldogs, Pugs), floppy ears (Spaniels, Hounds, and Retrievers), or internally hairy ears (Poodles, Schnauzers), often become itchy from yeast or bacterial infections in those warm, moist environments. Temperament also plays a role; if yours is a sensitive breed, consider a holistic anxiety remedy to help ease your pet’s emotional reactivity. Although not usually recognized by veterinarians, vaccine reactions can include dermatitis and itching. This occurs in both cats and dogs, and can result after just one vaccine. Please read our article, “Vaccination Basics,” for more details on this important health issue. The homeopathic remedy, Thuja can be helpful for pets that may have vaccine-related issues, particularly skin issues occurring after vaccination. Several glandular imbalances can cause skin problems that contribute to itching in some pets. Glands within the skin itself can malfunction and cause skin itching, odor, and discharge. Systemic conditions related to major endocrine glands, such as the thyroid and adrenal glands, may also occur. (decreased thyroid function) occurs naturally in dogs, and rarely in cats, usually after treatment for overactive thyroid (hyperthyroidism). There is some evidence to suggest that autoimmune hypothyroidism (about half of cases) may be related to vaccination. Hypothyroidism can cause the skin to become greasy, foul smelling, and in some cases itchy; the hair often becomes very thin and brittle, starting at the tail. (hyperadrenocorticism) is a condition of adrenal gland over activity that may stem from an adrenal tumor, or from the pituitary gland. Skin problems are common in Cushing’s disease, including thin skin, hair loss, and sometimes itching. Endocrine diseases are serious problems that require veterinary treatment, so always have your pet examined when unusual skin issues or other symptoms arise. Our article, “Thyroid Disorders in Cats and Dogs,” provides additional information. The skin is the largest organ of elimination. Many irritants, residues, and compounds can be excreted through the skin. This is part of why pets develop skin symptoms from allergies that, in people, cause respiratory discharges. A temporary bout of itchiness or rash, especially after a change in diet, or after holistic treatment such as homeopathy, it may be part of the healing process. This shouldn’t last long (usually 2-3 weeks), depending on your pet’s history and initial state of health. We carry an excellent homeopathic detoxification aid, Newton Homeopathics Detoxifier, which can help pets eliminate toxins as part of an overall health program. Of course, please work closely with your veterinarian during any detox process. Please see our articles, “Fifteen Steps to Detox Your Pet,” and “When Is It Time to See the Vet?” for more information. While this “Top Ten” is not an exhaustive list, it will give you a place to start with the most common causes of itchy skin.